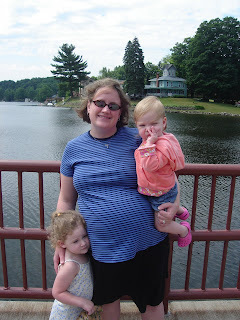 My girls and me in Findley Lake, NY. First of all, thank you for your comments on my last post. Yes, I know I've bribed you to leave a comment, but I really appreciated what you had to say (especially you, New Kensington--I thought that was you!!). It's not too late to enter and be sure to check back on Friday to see if you're one of the winners! Because many of you commented about enjoying the birth stories, I was encouraged to finish out the set. I've purposely been dragging my heels on this one, since it was such a hard experience and I'm still processing it, I think. Being pregnant with Linus and his delivery were the hardest by far. Many of you went through last August with me, in person and through the blog, and that was indeed a very difficult time. However, the difficulties began long before last August. They started before the positive pregnancy test, in fact. In mid-January, I started spotting and then I took a test...to know if it was a miscarriage or not. I know I'm weird. The test was positive, the spotting continued. The next day, Duncan left for a five day business trip--to California!! While he was gone, the spotting turned to bleeding. I was certain that the little life inside of me was over. I had an appointment to see a new ob/gyn (we'd changed insurance) that day and I was preparing myself to hear that I wasn't pregnant. The P.A. that I saw commented empathetically that it was an awful lot of bleeding. They did an ultrasound and amazingly there was still a sack! I hadn't miscarried yet! So they drew blood to check my hormone levels and told me to come back to have more drawn in two days to see which direction they were heading. Upon the next blood test, my levels were going in the right direction, so I still wasn't miscarrying. The bleeding turned to spotting. I went back for another ultrasound a week or so later and saw the heartbeat! At that point, my anxiety level was so high and I just felt like I couldn't take it anymore. In the middle of the night, I cried out to my God, begging him for mercy. I prayed specifically that if I was going to miscarry, that he would speed up the process, so that I could move on with my life. I then prayed specifically that if I wasn't going to miscarry, that the spotting would stop. I was so thankful. Such a heavy burden had been lifted from my heart. I couldn't stop praising God for his mercy on me. I had another episode of spotting exactly four weeks later which made me wonder if I was going to be one of those women that get their period throughout their pregnancy. But fortunately it only lasted for a day or two and didn't happen again. The next issue was Paxil. I had been taking Paxil for over 10 years, had taken it through both of my pregnancies with the girls without a hitch, but my new doctor wanted me off of it. There had been some new findings about complications it could cause in pregnancy and he did not like that I was taking it. The new complications (pulmonary hypertension in the baby which may require a heart and lung transplant) weren't an issue until after 20 weeks gestation, so I had a few months to work on making a transition to a new medication. In the meantime, I had an ultrasound at 16 weeks with a perinatologist to rule out the heart defect that Paxil could cause at 5 weeks gestation. His heart looked fine along with the rest of him. They mentioned that I had placenta previa, but at 16 weeks, it was very likely that the placenta would still move up. I can honestly say that I completely forgot about this tidbit of information, since it didn't seem like a big deal. The Lord kept me from doing any research about the condition, so I was blissfully ignorant about what may happen. Next up was an appointment with a new psychiatrist (remember, we had changed insurance). He said he would never put a pregnant woman on Paxil and also strongly recommended that I go off of it. And it wasn't just Paxil I had to stay away from, it was all SSRIs which include Zoloft and Prozac. So I needed to try a different class of medications all together, which wasn't specific to my generalized anxiety disorder. The best he could do for me was Wellbutrin, which was more specific to depression...not my primary problem. But we decided to go ahead with the switch, which had to be pretty quick (far too fast for going off of Paxil) since I was approaching 20 weeks. I went off Paxil in about a week and a half a paid for it. I had such bad withdrawl and at that point, my emotional health was very poor and wouldn't get back to (just about) normal for almost a year. The next significant event was an ultrasound at about 27 weeks. This was a follow-up from the 16-week ultrasound to check on the position of my placenta. They had to remind me of that at the appointment, since, as I said before, the issue had not, mercifully, solidified in my brain. As I laid on the table, the tech did her job and pointed out all of the fun stuff to Duncan and me. She then got the perinatologist who informed us that I did indeed still have placenta previa and, while it could still move, it was unlikely at this point in the pregnancy. He laid down the list of what could lay ahead, including the potential for placenta accreta due to the scar tissue from my two previous c-section. It was scary, to say the least. He told me that my activity level should be light and that bed rest may be in my future. I left that appointment reeling with emotion and with an appointment to go back in three weeks. I had an appointment with my ob/gyn the next day and shared the findings with him. He informed me that he didn't want me traveling and that he wished I lived closer to the hospital. He told me that if I ever had any bleeding, I was to go directly to the hospital without even calling him first. He told me that bleeding could go from hardly anything to really heavy very quickly. I left that appointment even more stressed about the situation, wondering what the future would hold. I'll save the rest for another post (or two), since this is getting long and Sesame Street is almost over =). Sesame Street over ALREADY??!! How CAN you leave me hanging like that?!?! :) What a story your little Linus has! Oh Nancy, I remember how hard this pregnancy was for you. At least we know the story has a happy ending...you have a beautiful, healthy baby boy. Praise God!!! nanc--just a quick comment (superwhy is almost over!) . . . i had no idea even the beginning was so hard. i jumped in when you were already in the hospital. i'm glad that you were able to see God working throughout the pregnancy but what a hard, hard experience to go through! Wow, it's amazing to me how similar our stories are (although, admittedly yours was a worse degree) but I had first trimester complications along with the later placenta previa and I remember praying that I would just miscarry and be done and be able to move on. I begged God to not drag on the not knowing and worrying. It's a hard place to be but oh what I learned in that time! Thanks for sharing your struggles. Nancy-- I was going to comment, but I think Mel said exactly what I was going to say. It's an amazing story to read and I'm SO glad the ending is happy.... you've got some courage, girl! And God is good, isn't He?